These are nicotine patches (“patches” used in three steps: 21 mg-14 mg-7 mg), the nicotine gum (2 mg, 4 mg), sprays, inhalers, pills like bupropion (Zyban) and varenicline (Champix / Chantix), to name only the best known pharmacological aids. These products are recommended for people who suffer from fear or suffer significantly unpleasant withdrawal symptoms. Research has shown that these nicotine replacement therapies (NRT) can double the chances of successfully kicking the habit, as long as they are accompanied by psychological and behavioral support as offered by a doctor, services “I Stop,” or any other person or service recognized as reliable. Indeed, these products do not neutralize all the cravings that occur in the different situations usually associated with smoking behavior. The emotional associations related to smoking – representing the psychological dependence – are often difficult to overcome. A medical examination is recommended to ensure that the anti-smoking therapy should be considered in your health profile. Although some of these nicotine replacement therapies (NRT) are sold without a prescription, although you are advised to check with your pharmacist or doctor. The patches and gum help the ex-smoker by providing a constant diffusion of nicotine for 24 or 16 hours, depending on the companies stamps. If the dose is too high (your sleep is restless, and you are having nightmares), it is advisable to remove the patch at night. It is recommended to follow the full treatment. Don’t smoke while you are using nicotine patches. Pills such as bupropion (Zyban), and varenicline (Champix / Chantix) do not contain nicotine but act on areas of the brain that are stimulated by nicotine. Result: The person usually feels less of the need to smoke . In addition, bupropion appears to significantly reduce weight gain in some people. Discuss with your doctor. See: Nicotine Withdrawal Timeline and Symptoms. It should however be noted that there is no miracle that will make you succeed in your attempt to quit smoking without you making concentrated effort. But that does not mean that it must be painful. This is the purpose of this site, it is to help you quit smoking using a personalized approach, in a safe and fun environment. In fact, did you know that laughter and pleasure are one of the best strategies you can use to free yourself from your addiction to tobacco? Your brain then becomes able to produce endorphins by itself. Addiction is created by a reaction of the brain to reduced levels of nicotine in the body, hence creating the need for you to regularly smoke and it always take a little longer and a little more to get the same effect as the last time. Physical dependence is expressed by unpleasant withdrawal symptoms when the amount of nicotine in the body becomes insufficient. Although the withdrawal symptoms are not as dramatic as those caused by detoxification from heroin or cocaine, the addictive grip of nicotine is much stronger! when you receive a positive evaluation (promotion, commendations at work, etc.). when you’re in love … Etc.. This is why you want to repeat these activities: they make you feel good because your brain produces endorphins when you engage in them. When you inhale the nicotine from tobacco smoke, you teach your brain to produce endorphins and manage mainly with the nicotine and you will become reliant on it to feel good. In addition to physical dependence, nicotine and smoking causes a very powerful psychological dependence. For every cigarette you smoke, you inhale on the average of 10 to 12 puffs. So for every cigarette you smoke you are injecting this drug (that contributes to your well-being) a dozen times into your body. Yes, smoking is nothing but a kind of syringe: an oral syringe. Each of these bursts will be positively associated in your brain to the event or situation that you were in at that moment. Whether you were having fun, you were bored, you were stressed or you were angry, you will ultimately rely on cigarettes to help you feel better. So in addition to having made your brain physically dependent on an external drug you will become programmed to associate smoking with all of your life situations. It is for this reason that many smokers talk about smoking as a friend. Rather sad, is it not? And all this about a roll filled with pieces of a plant … You surely now understand better why it is so difficult to quit smoking … For a better understanding of this phenomenon, see the fact sheet you panic at the thought of quitting? The less influence (dependence) that cigarettes had over these people; an inner journey made by them which led to a firm decision to kick the habit and with this decision came an unwavering desire to succeed (motivation) and also the identification of actions to be taken to overcome the obstacles. It is this kind of inner journey that this site seeks to make you realize. Also see our post on Nicotine withdrawal timeline. Think about it: Over the years, you have learnt how to manage your life with cigarettes … A cigarette supports you in every situation of your life, yet the more you consume it the more you are addicted to it and it slowly poisons you and you are also losing a small fortune with this habit. Do you really be able to experience these situations, in fact, your life without this insignificant paper cylinder stuffed small pieces of plant? Most people do not smoke, yet they also know how to party, how to go through difficult or annoying times. So …The sooner you decide to take action, the better your chances of learning how to breathe without that cigarette. Quit smoking cold turkey – Why you should try to quit cold turkey? When you’ve been a smoker for a period of time, the thought of quitting smoking cold turkey is very scary. Let’s face it, it’s part of who we are. You need to have your normal cigarettes daily, so how the hell are you supposed to quit smoking cold turkey when you have to spend today and tomorrow, and even the next day. Is quitting cold turkey, even the best way? First we have to know why it is so difficult to quit smoking in the first place. Quitting smoking is both a mental and a physical war, but for the most part, what stops us is the suffering from the physical aspects. Or should I say physical dependence. Smoking is addictive because of nicotine. Because you smoke, the nicotine content of cigarette puff inhaled runs with blood. Basically making your body accustomed to having it in your bloodstream, it has become a part of your chemical makeup, so when the nicotine in the bloodstream begins to lessen, your body begins to react. Essentially, your body starts to panic because it feels as if something crucial is missing. Your body does not know that nicotine is not crucial, or even good for you. Either way, your body tricks your mind into thinking it needs this substance, and therefore sends you out for a cigarette. You feel like lighting one right now don’t you? This is where the mental part comes in. It’s basically a mental habit, until you start to get low in the blood, then your body goes into overdrive to make an emergency. So the question, If you stop smoking cold Turkey is … The withdrawal symptoms, that is why you need to prepared before they start, see the nicotine withdrawal timeline. The answer is, of course you will go through withdrawal symptoms, but the duration of the withdrawal will be much shorter, if you quit smoking cold turkey rather than stretch. In addition, the fact is that you are much more likely to actually quit for good, if you quit smoking cold turkey. The fact is that when you try to wean off cigarettes, you are simply obeying your bodies response of panic and anger when your nicotine levels get low. Basically, it’s like giving a constantly crying baby what he wants. The problem simply becomes worse and more difficult to correct. When you quit smoking cold turkey, you deplete your level of nicotine quickly and once and for all, and once that is done the body will no longer need or want it. Your body reacts when the level is low, but not when it is empty. Once this is done and you are able to cope with the quit smoking withdrawal symptoms, then the only thing holding you back is the mental habits that are much easier to break than the physical need. Vaccine against nicotine Addiction: where is the research? To help smokers to stop smoking, there are quit smoking products but they are not always effective, particularly in the long term. Hence the need for new therapies. The vaccine against nicotine is one of the avenues of research. What is its principle? Where are the tests? Zoom on the vaccine against nicotine addiction. In cigarettes, nicotine is the addictive component. It is a natural drug also produced by the brain. And like all substances that cause addiction, nicotine increases the amount of dopamine – * which is a neurotransmitter involved in the sensation of pleasure – in the brain. The mode of action of nicotine? It mimics a natural neurotransmitter, acetylcholine, and binds to its receptors (nicotinic receptors). These receptors are carried by neurons in the reward pathway, dopamine neurons. Nicotine stimulates the neurons. More nicotinic receptors are stimulated, more dopamine is released. * Note that our Brain cells communicate with each other through neurotransmitters. The principle of a vaccine against nicotine addiction is as follows: neutralize nicotine in the bloodstream before it reaches the brain. For this, we must make visible the nicotine so that it is recognized by the immune system. In fact, nicotine is a very small molecule that easily passes the natural barriers to reach the brain. Hence the idea to associate nicotine inactive fraction of virus to elicit an immune response, the anti-nicotine production. In the immunized person, nicotine binds to the antibody. This complex is too large to cross the brain barrier. The amount of nicotine entering the brain is so much lower, resulting in a loss of pleasure when the person smokes. Please note: the urge to smoke is not affected with this vaccine but smoking no longer meets this need. This vaccine could help smokers quit smoking and also to prevent relapse after stopping. Researchers around the world have been working for more than 10 years on an anti-smoking vaccine. Three laboratories are the most advanced in this research: Celtic Pharmaceuticals Holdings (vaccine Ta-Nic), GSK-Nabi (NicVAX vaccine) Cytos Biotechnology (Nic 002 vaccine). The tested vaccines are therapeutic vaccines for smokers who failed to quit smoking with other methods of weaning. Pre-clinical studies and testing phases I and II in humans have shown that these vaccines resulted in production of anti-nicotine antibodies were well tolerated and more nicotine antibody rates were high, the more likely withdrawal were great. In 2007, Celtic Pharmaceuticals Holdings LP has started Phase II clinical study for its anti-nicotine vaccine Ta-Nic, to ensure abstinence rates at 6 months and thus its safety. The results are not yet known, but Phase I has already shown an abstinence rate at 12 months for smokers who received the vaccine. Earlier, phase II clinical study of NIC002 (also known as Nicotine QB or CYT002-NicQb) of Cytos Biotechnology lab has shown that the vaccine promoted and strengthened weaning smokers who stopped and antibody reached a high anti-nicotine level. However, side effects (same symptoms as the flu) appeared in many people after vaccination. In 2007, CYTOS concluded a partnership agreement with Novartis. They started in 2008 Phase II trial of the vaccine with a new formula to limit side effects. However, the first data showed that the first goal (a total withdrawal between 8 and 12 weeks after the start of treatment) was not reached. Probably because NCI002 failed to create enough antibodies. Nabi / GSK announced successful results of Phase II for their NicVAX vaccine. It is safe and well tolerated, and it generally produces antibodies to nicotine at very high rates. In subjects vaccinated with NicVAX, a link was noted between antibody levels and their ability to quit smoking. A significant number of subjects was able to quit smoking and remain abstinent for a long time. NicVAX is currently in Phase III of its clinical trials. The laboratory aims to determine the effectiveness for smokers. If these trials are successful, the vaccine could soon be on the U.S. market. A fellow at the independent laboratory Pharmaceutica AB is currently developing Niccine a supposed preventive treatment and a nicotine addiction vaccine. In 2008, the lab announced that the recruitment of 355 smokers for phase II clinical study was completed. The purpose of this study? To demonstrate the ability of the vaccine to prevent relapse when stopping smoking. The results are encouraging, but there are still a number of questions about the anti-smoking vaccines. Firstly the necessary reminders. With these vaccines, it is possible to protect against relapse in re-vaccination within a certain range, but for now, no study has been conducted on these boosters. In addition, intramuscular injections are painful, especially if you must do it a regular basis. Other forms of vaccine are considered. A test on mice showed that with intranasal vaccination, a significant anti-nicotine rate is obtained. Another question about this vaccine: one might consider prophylactic vaccination would prevent becoming addicted to tobacco? This raises many questions: Can we vaccinate against a behavior and not against a disease? What about consent? For example, could parents vaccinate their children or teenagers defensively without their permission? Does this vaccination replace information on smoking and its dangers? Finally, nicotine can be used in treatment, particularly in the context of ulcerative colitis (inflammation of the intestine). A preventive vaccine would prevent the use of nicotine as a medicament. The vaccine against nicotine today seems an option in the fight against tobacco addiction. But it surely will not be the only answer. Research on new pharmacological approaches are also underway. And in any case, it is necessary to also add a counseling treatment. Why is it difficult to stop smoking? You probably started smoking because everyone around you smoked, or because you think it gives you look cool. Today you want to quit smoking but do not know how, or do not feel you are able to do it. Why is it difficult to stop smoking? Because smoking is an addiction that is both physical and psychological. Quitting smoking is not easy, but it is not impossible. The proof is the millions of people who have managed to stop before you. Learn to stop smoking, taking inspiration from what happened are: do you motivate, create your individual plan or help you with solutions that exist in pharmacies. And of course, see the articles on this website which will definitely help you stop smoking. Why is it so hard to quit smoking? You already might have heard more than once about the dangers of tobacco. Smoking has disastrous consequences on every organ in our body, but it also causes a lot of diseases and reduces your physical well-being. Of all the diseases that smokers are more likely to catch than nonsmokers, includes cancer, heart attack, pneumonia, high blood pressure and cataracts. This makes tobacco the second leading cause of death worldwide. Surveys indicate that half the people who smoke today will probably die of a tobacco-related disease. Nevertheless, despite being aware of all the consequences of smoking on health and despite the desire to quit smoking, stopping this habit is very difficult for many smokers. This is due to the fact that smoking is an addiction that is both physical and psychological. If you want to stop smoking in the best conditions, you need to understand what these two types of addiction are and identify what role they have played in triggering your smoking addiction. Nicotine, the addictive chemical component found in all cigarettes, is the source of your physical dependence on tobacco and also for the symptoms that you experience when you stop smoking. When you inhale a puff, nicotine passes through the blood and it is to be found in the brain within seconds. Once it is in the brain, nicotine triggers a number of biochemical changes, especially the secretion of adrenaline and dopamine. The feeling of being more concentrated or more awake after smoking a cigarette comes from this production of adrenaline by the body. At the same time, our brain will produce dopamine, the pleasure molecule, creating a feeling of satisfaction and relaxation. Nevertheless, the level of nicotine in the brain, as well as the effect of smoking pleasure disappears in a few minutes. This is what triggers the vicious cycle of dependency because you need to smoke another cigarette to continue to feel good. The symptoms of nicotine withdrawal are listed below, also see the withdrawal timeline. In addition to physical dependence, tobacco is often accompanied by psychological dependence. If you have smoked for a while, then the fact is that your cigarette smoking has become a habit and became fully integrated into your daily routine. This can be illustrated when you smoke while you take your morning coffee when you take a break at school or at work, or when you are driving at night on your way home. Also, maybe your friends, your family members or colleagues also smoke and smoking in their company has become a way to interact with them. Because of the addictive effect of nicotine on the brain, you may also consider cigarette smoking as a way to overcome your stress, your anxiety, your depression or even your boredom. And if you use cigarettes as a way to regulate your emotions when you feel bad, stopping smoking will be very difficult. To successfully quit smoking, you’ll need to explore and understand what drives you and makes you want to smoke so that you can get a solid action plan to permanently stop smoking. It has been a little over a year since I stopped smoking. I had been a heavy smoker before (almost a pack a day) and quitting smoking has been a real victory over myself. It has also given me confidence: it showed me that I was able to improve and even helped me see what to do in other areas of my life. So I wanted to share with you the tips that helped me to stop after several unsuccessful attempts. I want to say that one can find many other tips, especially on the internet, but my goal is to present only those that have worked for me. Making public your intention to stop smoking will help you because it will prevent you from reneging . Once everyone is aware, there is no turning back. Personally, I tried to stop smoking without talking about it, but it never worked. I think it was just too easy to take “neither seen nor heard” no one knows anything about my failure. I think the contrary, engaging with your family and friends, you will feel more obliged not to disappoint and this will give you extra motivation. Some of them will support you and will give you support when you will doubt. Other people will doubt you and think that you will fail: showing these people that they are wrong will be an even greater motivation. Personally, when I decided to stop, I got positive reactions around me, except for a friend who did not take me seriously and told me he was sure that two days later I would smoke it again. I must say that although I was unpleasantly surprised at first by this reaction is the one that helped me the most. In effect, then I really wanted to make a point of honor to show my friend that he underestimated me. This book is famous for having helped many smokers to quit. You’ve probably heard because there are many stories that have been circulating for years on this book. Including those who have stopped smoking after reading this book so that they had no intention before. You can even hear some say that this is a foolproof method. I would not be so categorical, but in any case, I can say that this book gave me a decisive help. Unlike the traditional method, which is based on the will, Allen Carr emphasized more in this book about all the unconscious and irrational factors that will enable us to succeed. One major criticism of this book is that it is sometimes considered the brainwashing … and I agree with that. However, I think that brainwashing is useful. It can even make the brainwashing that we had made ourselves over the years to streamline the smoking. Moreover, when I quit, it was very helpful to read this book whenever I felt an urge to smoke. Perhaps this book simply works by placebo effect, because we are convinced that it will finally allow us to stop. But after all, as it helps us to stop smoking, no matter whether it is a brainwashing or a placebo effect. One of the great dangers, when you stop smoking is to become obsessed with cigarette cravings. Everything around us seems to remind us of our desire and whenever you pass a tobacco store, it seems that the cigarettes behind the glass is whispering “just buy a final package.” Ok, I am exaggerating, but you know what I mean. Constantly thinking about this craving is torture and this is constantly testing our will. This is why it is best to try to limit it to the fullest. it is useful to try to household activities that allow us to soothe our soul. For me, sport was the activity that has helped me the most when I stopped smoking. Firstly because while playing sports, you obviously do not smoke. And when we are done, we want everything except a cigarette. In addition, the physical lack that one experiences during the first few days of stopping smoking is primarily an excess energy (released from the poison that is nicotine, our body has more of energy than what he was used to). Other activities can also help when stopping. For example, I personally know that I think less of smoking when I play video games. Finally, if you have situations in which you never smoke (eg. a non-smoking friend who does not want smoking when he is around), it is the perfect time to spend more time with them. This one is a classic but it helped me a lot. I suggest you do as I do: calculate each day that you have not smoked much you have saved and put that money aside. This is the amount that you can use to reward you for your stop. You can, for example, during the first days, offer a small reward for every day (or every 2 days) without tobacco. Then you can decide to make your stay if you can not smoke for more than 6 months, for example. No matter what this award, as it allows you to increase your motivation. If you use this method, you will find that after some time, the amount saved will be so large that you will not need to use them all to give you your rewards. And believe me, it does not take long for you to realize how nice it is to spend money on clothing, restaurants and travel (delete as appropriate depending on your tastes) than cigarettes. For example, I remember that after a few days off, I felt an almost irresistible urge to smoke. To avoid smoking I made myself a promise to wait for two hours, i decided to go running, and if on returning I still wanted to smoke, then I’ll be justified . Of course, two hours later after my sport, the desire was gone, and I never came back. Other techniques are fairly well known example of a drink of water or eat an apple whenever a desire is felt. I insisted to eat an apple and not something sweet for weight gain easily becomes our enemy in an attempt to stop: note that we have gained a few pounds might induce us to abandonment. Personally, I focus on my breathing, the freshness of my breath and the air I breathe also helped me in those moments. Finally, when the urge is over, do not forget to congratulate yourself: whenever you overcome your desire, you become a little stronger. There are about 50 such cravings to overcome during the first three weeks after smoking cessation. Every desire will be a little less intense than the last, until you finish by not even thinking about it. What I liked in Allen Carr’s book is that it advises not to use patches. Me too, for having tried without success, I think the patches are not always a good idea as it seems. First, patches are used because they can push the physical symptoms of lack during the first month. Time to wean the gesture of smoking. But this lack actually lasts a few days. Lack then becomes more mental and emotional (which is why it is sometimes said that the gesture we lack). So therefore face this physical shortage immediately to be rid of it once and for all. Also, do not use palliative immediately allows us to learn to deal with our desires. If patches are used, then avoid these difficult situations. When they stop, they will suddenly find themselves confronted with urgent needs that we have not learned to respond. The risk of relapse will be very important. Our mind is sneaky: it will always try to rationalize our cravings and find reasons to satisfy it. This is something that is difficult to resist especially when the urgent desire to smoke is before us. This is why we need to have prepared for it in advance and have decided that we no longer smokes not even a single puff. Because the truth is that this is going to bring a second puff, then a third … and we have started smoking before we even realize it. What I did, personally, it is telling me that not only one puff did not exist but it would cost me thousands of dollars (or more years of smoking over a pack a day). At this price, you will think twice before returning to smoke even when the urge is urgent. Personally, I have heard many say that he had to avoid all circumstances that might give rise to cravings. This means not drinking coffee because it was used to accompany a cigarette … not go out because they smoke in the evening …. and even no longer seeing his friends for some time if they are smokers. I’m not at all in agreement with these tips and I think it is even a crude trap. In fact, doing so is to forgo much of the pleasures of life: it will aggravate the cravings associated with smoking and will give us the impression that life was happier when ‘we smoked. We’ll get the impression that one can not be happy without cigarettes and this will push us to plunge sooner or later. In addition, they inevitably comes a point where you have to confront these situations that we seek to avoid: we can not remain forever cloistered at home without friends. And then, the risk of relapse will be much greater. 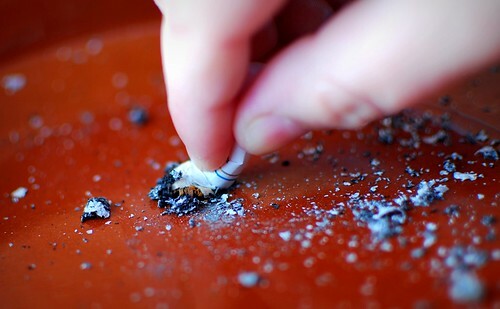 I think it is important, however, to force to separate the idea of ​​pleasure of smoking. We must seize the bull by the horns and not hesitate to go out, even if you just quit. Of course, the temptation will be there, but if you manage to ignore, you know already now that your quit attempt will be successful. After all, if you were able to go to this party and avoid smoking, it means that you will always be able to face your demons and resist temptation. Another common pitfall, I think, is to want to register on a dedicated forum on the internet. Of course, it seems logical to think that we will find a moral support to help us pass the difficult period. But ultimately, the people with whom you discuss will only emphasize how difficult it is to quit smoking and so scare you (even if with a good feeling). Additionally, constantly consulting forums on smoking cessation will only remind you of your cravings and therefore make your decision even more difficult. Believe me, I made an attempt to stop that way and I held less than two days (and I only thought of one thing, SMOKING, during these two days!). This advice seems trivial but it is the most important. If you are not convinced yourself that you will succeed, it is indeed unlikely to happen. Conversely, if you are firmly convinced of your success, it is unlikely that you will fail. This requires that you adopt a positive attitude and tell yourself that you are able to stop and that’s what you’ll do. Trust me, it will work! That was the case for me, so there’s no reason it won’t be for you. Do not worry, it happens to everyone. Myself I failed many times before i finally quit. The most important thing is to stay motivated to try and especially the ability to learn this failure: try to understand what made you fail. You can then understand what obstacles you have not been able to take and what conditions were not conducive to your success. You’ll be able to better prepare for your next attempt and make every effort not to get defeated by the same obstacle. Quitting smoking can be a very difficult decision to sustain, most people find it difficult to cope with the withdrawal symptoms that will most definitely kick in when you decide to stop your nicotine addiction. But after a while if you can hang in there you will see that you can never regret your decision to quit smoking, you will see a remarkable improvement in the quality of life you lead, but meanwhile here are Ten Tips to Help you Cope With Quit Smoking Withdrawal Symptoms to help you find your way out of the tunnel. 1 Get in touch and connect with people who are going through a similar situation as you. Do this especially if you are lacking in moral support or motivation. you can look around you to see if they are classes such as “Breath-Free”. 2 Increase the vegetable content of your diet, your diets should include lots of raw fruits, salads, fresh juices.limit your intake of fleshy foods or animal products. you could replace those with veggies and baked yams and potatoes. 3 Avoid drinks containing caffeine. This includes soft drinks such as colas, tea, and of course coffee. Caffeine acts in a similar manner to nicotine, and it can stimulate your cigarette cravings. Shut out alcohol in any form because it can stimulate your cravings for cigarette. 4 When you decide to quit smoking it is always advisable that you stop completely rather than reducing your cigarette intake gradually. Taking the gradual approach to quitting smoking could in the long run weaken your resolve and it also increases your discomfort. 5 Drink lots of water. It is very important that you stay hydrated. Staying hydrated helps in the cleansing process, where when the accumulated nicotine in the body is being flushed out. Also drink lots of juices and herbal tea. 6 Ensure you get lots of sleep and that you are always properly rested. 7 Take time out to go on short walks, do this so you can breathe in fresh air. Fresh air helps in cleansing the lungs and can also soothe your nerves. 8 Always carry a plastic lemon juice with you, use this when ever the urge to smoke hits you can squirt a bit of the juice into your mouth, this will relieve you of your cravings and its also good for your health. 9 Use nicotine patches to relieve cravings any time they hit you, although the use of nicotine patches is some what controversial it non the-less represents a method of relief for those with extreme nicotine addictions. 10 And finally if you must smoke please do use an electronic cigarette. Electronic cigarettes have the advantage of containing little or no nicotine and they do taste like traditional cigarettes.